Victoria and Albert Museum in London hosts the spectacular Christian Dior: Designer of Dreams exhibition. Christian Dior is a famous designer and couturier that shaped the history of fashion with his ‘new look’ silhouette. He gave women feminine and luxurious clothes after the war and made them dream of better, more prosperous times. That’s why the name of the V&A’s exhibition Christian Dior: Designer of Dreams fits perfectly. Dior was after all the one who through various collections in his career stayed true to creating dreams of beauty and femininity. Spanning from 1947 to the present, the exhibitions explores the most iconic looks and silhouettes Christian Dior created, brand’s enduring influence on modern fashion as well as the link between Dior and Britain. More than 200 rare haute couture garments are on display together with accessories, photographs, illustrations, original makeup, vintage perfume, magazines, and Mr. Dior’s personal possessions. Stunning gowns are shown in breathtaking ethereal settings making this exhibition a visual feast for the eye and the soul. Exquisite craftsmanship, amazing fabric and incredible attention to detail are what makes these pieces outstanding. Leading you from “The New Look” and designer’s most defining silhouettes, the show reveals pieces of history and cultural references of the times. It then explores “Dior in Britain” before shining the lights on those who have continued building the Dior brand on Christian’s legacy. Some of his successors are icons on their own. Let’s just mention Yves Saint Laurent, John Galliano, and Raf Simons, among others. And while Christian Dior worked in his own fashion house for only ten years, the effect his clothes had were incredible right from his first collection. In that short period of time, he contributed shaping fashion and sealed his name in history. 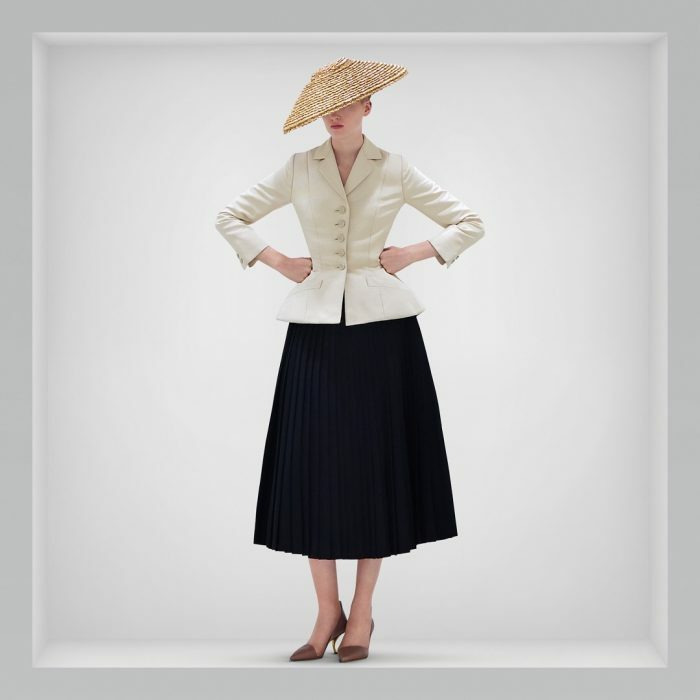 You can learn more about Dior’s amazing journey by visiting this exhibition that is on display until Sunday, 14 July 2019. All information needed to plan a visit is available at V&A website.